Rocco, you are in our hearts! Posted by Marsha Goodale on 2019/03/11 in Articles, Events, Slideshow, The Rose | Comments Off on Rocco, you are in our hearts! Home » Articles » Rocco, you are in our hearts! The Windsor Rose has lost a beloved and dedicated employee and chef after a sudden heart attack. He is survived by the entire Windsor Rose team, but most importantly by his wife, Rita ( married 46 years) and daughter, Debora who both work with us in the front of the house. 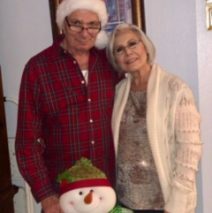 Many of our customers know both Rita and Rocco from when they frequented their Italian restaurant, “Casa Mia” formerly in Tavares, FL. Cards for Rita & Deb can be mailed to The Windsor Rose 142 W. Fourth Ave. Mount Dora, FL 32757.